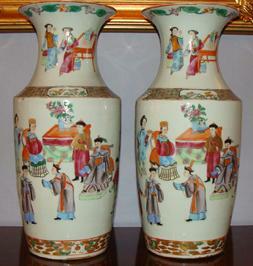 Pair of tall Chinese Export Porcelain Mandarin vases with finely detailed Chinese figures. Tea being served, Pipe smoking. Unusual borders. Glazed chip on rim of one otherwise perfect condition. 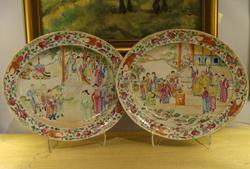 Chinese Export Porcelain Mandarin oval meat dishes with unusual court yard scene. Lush fruit floral and butterfly border. 13 ½”W x 10 5/8”H. 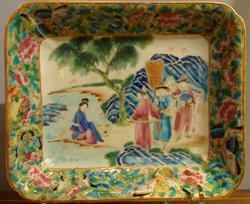 Chinese Export Porcelain Mandarin notched cut corner rectangular fruit server. Lady washing linens in a river while men and horse observe. One rim flake restore otherwise perfect condition. 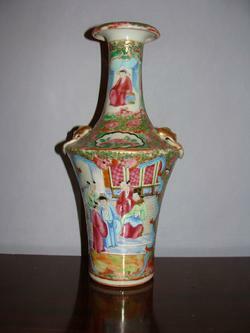 Chinese Export Porcelain Mandarin shaped vase with blue dragon reserves, mask ring handles and flared rim. Chip to one ring R. otherwise perfect condition. 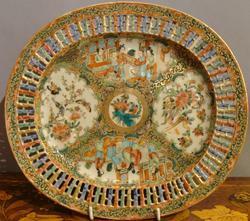 Pair of Chinese Export Porcelain Mandarin dessert plates with bird in lantern border. Provenance: Marienburg Castle, Hanover Germany – Collection of King Ernst August II (1771-1851 fifth son of King George III of England uncle of Queen Victoria. Chinese Export Porcelain Mandarin cake server with lush pomogranite floral and butterfly wide border. Excellent detail. 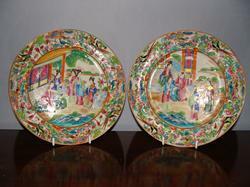 Pair of Chinese Export Porcelain large size oval Mandarin meat dishes with top quality decoration of Mandarins in court yard scene. Unusual fruit and butterfly borders. One Rim chip other wise perfect condition. 15 5/8” W x 13 ¼”H. 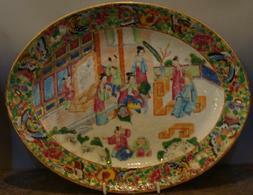 Chinese Export Porcelain Mandarin diamond shape fruit server with melon shapes reserves – excellent coloration. 10 5/8”W x 8 ¾”H. 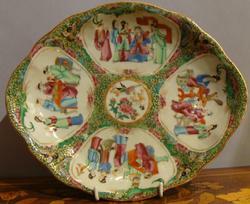 Chinese Export Porcelain large size reticulated Rose Medallion fruit basket undertray with Celadon C scroll reserves and Bargello banding. 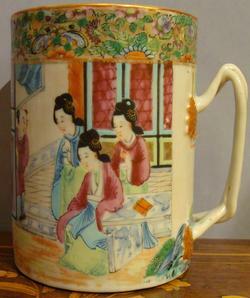 11”W x 9 7/8” H.
Chinese Export Porcelain Mandarin Tankard with finely painted continuous scene of figures in a courtyard – double strap handle with applied leaves and berries. 5 1/8”H x 5W x 3 ¾”D. 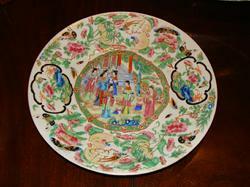 Chinese Export Porcelain Rose Medallion Cut – Corner Bowl (for Salad) with finely painted courtyard scenes alternating with birds fruit and butterfly panels. 9 ¾”W x 5 ¾”H. Chinese Export Porcelain Rose Mandarin all over scene snoutnose creamer with fruit floral and butterfly border. 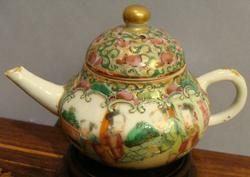 Chinese Export Porcelain Rose Medallion mini teapot with celery C scroll reserves. 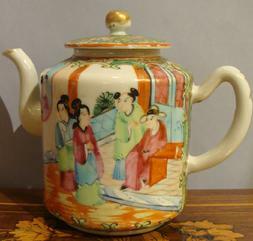 Chinese Export Porcelain Rose Medallion straight sided teapot with excellent coloration – celery green reserves. 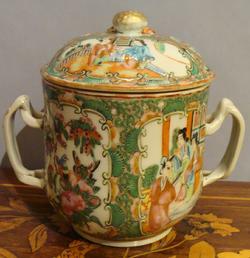 Chinese Export Porcelain Rose Medallion sugar bowl with twisted handles and berry finial on the original lid, celery green reserves. 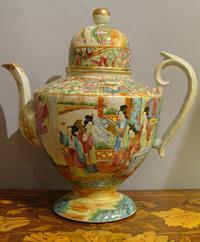 Chinese Export Porcelain Mandarin dome-top coffee pot with bird in lantern border. Exceptional decoration of Chinese ladies on a portico and Chinese ladies with mandolins in a courtyard. 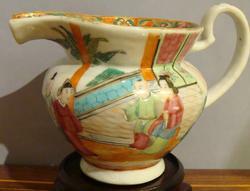 Perfect Condition, glaze frits on handle and finial. 10 1/4” h x 10” w.